In 1895 Marie Høeg (1866-1949) and Bolette Berg (1872-1944) established the Berg & Høeg photography studio in Horten, Norway. Marie Høeg and Bolette Berg in the boat. Ca. 1895-1903. Preus museum's collection. They took portraits and views of Horten and surroundings and lived on the proceeds from sales. Horten was a naval base with the main shipyard for the Norwegian navy and had a strong flow of people who needed photographs for celebration and recollection. Perhaps that is how the two photographers understood by the very process of portraiture how important it is to stage oneself and to what a large degree that contributes to how we are perceived. The museum collection has 440 glass negatives from Berg & Høeg. Among the cartons in the 1980s were discovered some on which had been written "private." It is not unusual that photographers also have private photographs in their archives. But these were not ordinary keepsake pictures. They indicate that the two photographers, especially Marie Høeg, experimented with various gender roles. We know that Høeg was the extrovert and started groups such as Den selskbelige Diskusjonsforening (The Social Discussion Association), Horten Ledd av Landskvinnestemmerettforeningen (the Horten Branch of the National Association for Women's Right to Vote), Horten Kvinneråd tilknyttet Norske Kvinners Nasjonalråd (the Horten Women's Council linked to the National Norwegian Women's Council), and Horten Tuberkuloseforening (the Horten Tuberculosis Association). Bolette Berg was less in the public view. However, she must have been back of the camera in many of these photographs, which have attracted international notice. We find several such boundary-breaking photographic projects in Europe and America around 1900. They correspond with women's battle for full civil rights and the right to define their own identity. So these photographs are a part of an international history – or herstory – that has meaning and recognition value for all women, including now. 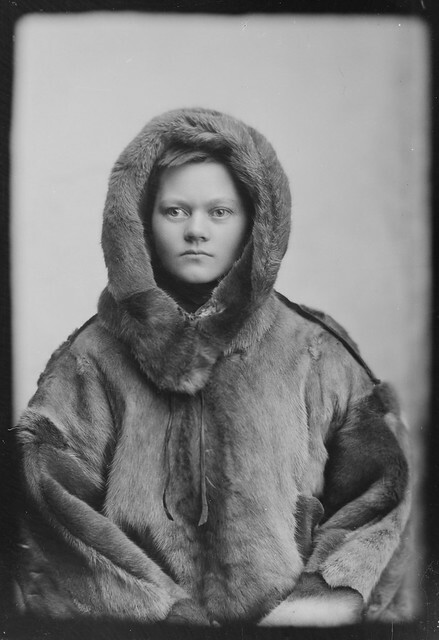 Berg & Høeg, Marie Høeg in sealskin fur, ca. 1895-1903. Preus museum's collection. Berg & Høeg, Marie Høeg sett forfra, i vidt strikket undertøy (Macco). ca. 1895-1903. Sølvgelatin på barytt.